A depiction of the New Motor. Artist unknown. Those who already knew anything of the man might have figured he had simply snapped. Spear’s outspoken views on abolition and women’s rights, among other topics, led a number of churches to drive him out, and, in 1844, after a particularly vigorous denunciation of slavery, he was beaten and left for dead in Maine. A picture of Spear, and the title page of a tome of the Electricizers’ revelations. He recovered, and, in 1851, with the Electricizers’ plans dancing in his head, quit the ministry. Two years later, he began his work on the machine, with a result stranger than fiction. With “spirit guidance,” Spear constructed a contraption of zinc batteries, metal balls, and thousands of copper wires, encased in a wooden frame. He named it the New Motor. 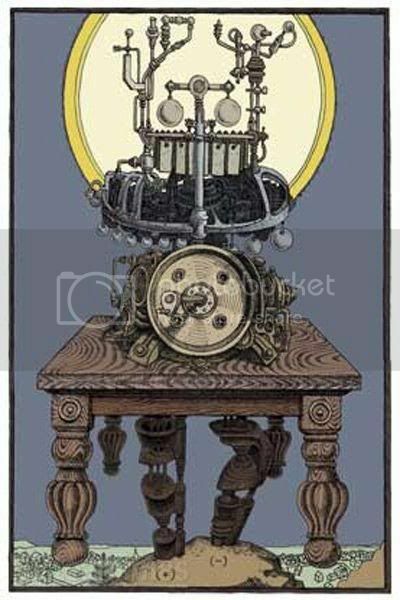 The purpose of this machine was as vague as the man himself, but he claimed that it not only harnessed spiritual electricity, but also housed an as-yet unborn soul. It’s a fascinating story, with its simmering combination of techno-lust and old time religion, complete with a fearful mob appearing on cue to smash the misunderstood monster. Some accounts, by contrast, speculate that the machine never moved at all and Spear made the whole thing up. Either way, his ambitions never entirely recovered from the loss of “Heaven’s last, best gift to man.” The rest of his life never saw anything as batshit grandiose as the New Motor, though he remained dedicated to his causes: for years he ran a section of the Underground Railroad and agitated for causes from pacifism to prison reform. 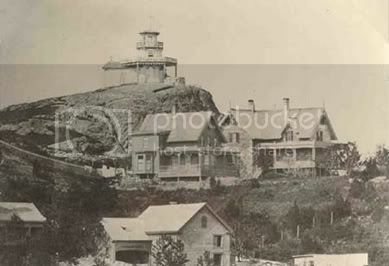 High Rock near Lynn, Massachusetts, where Spear first built the New Motor. Spiritualists swore they saw angels in the area. With the destruction of his precious machine, Spear next emerged leading a commune in Kinatone, New York, “where children were raised in a common house and marriage was abolished in favor of complete sexual freedom,” according to Goldsmith. He ended up, like many others in his and overlapping subcultures at that time, advocating socialism, and moved around the country until dying in Philadelphia in 1887. It’s easy to imagine Spear’s odyssey through various spin-off scenes, in his later years almost a relic from another time, people grabbing his sleeve and asking “hey, aren’t you the guy who made that New Motor thingy?” It’s also easy to roll one’s eyes at the peculiar stew of ideas that led him to try to bring a machine god to life in a barn. Was he crazy? Yes. However, the same Spiritualist groups and radical churches that were eagerly awaiting voices from beyond also provided an essential organizing platform for other then-outre ideas like suffrage and abolition. Susan B. Anthony prayed for trances to help with her public speaking. Elizabeth Cady Stanton heard spirits knocking about her house. Spiritualist ministers like Henry Ward Beecher, who once bellowed to his congregation, “Ye are gods, your faces are crystalline!” became politically powerful advocates for an end to racial discrimination. Modern observers may see their mysticism as superstitious fancy, but to their past proponents, all of these revolutionary ideas were entwined. It’s no coincidence that, following the famous Seneca Falls Convention, women’s rights advocates elected Spiritualist Abigail Bush their first female president. We think of alternative culture as a modern phenomenon, but it’s as old as culture itself. The 19th century, like every other, wasn’t simple at all. It had its stew of Utopian schemes, parasitic hustlers and debates over authenticity. Hell, even Spear’s techno-religiosity has plenty of inheritors today. It’s also worth remembering that women having the vote was originally considered more far-fetched than talking to your ancestors through creaky furniture. That changed. 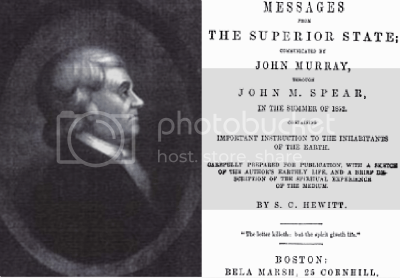 For every world-shaking thinker like Anthony in those fights, there were scores of people like John Murray Spear. Consigned to relative obscurity, maybe, but no less convinced that they were on the verge of bringing a new age into the world. The god machine’s heart was ripped out, yet by the end of Spear’s life, the former slaves he smuggled to freedom and the women who remembered his early assistance in their struggle might have noted that the man played his own significant part in leaving behind a world drastically changed from when he began. What, not a single pun in the entire article on deus ex machina? Seriously though, fascinating stuff; it really puts modern spins on the idea (like the Singularity folks) in perspective. Great story. Let’s also recall that the Burned-Over District of the 1820s produced another notable eccentric – Joseph Smith, who “translated ancient texts” by dictating chapters while staring into a hat, published a story of ancient Israelites who crossed the Atlantic in a kind of submarine (then fought amongst themselves until the victors, cursed by God with dark skin, became the Native Americans), and announced that God commanded him and his friends to take multiple wives. Some things are doomed, I think, to remain a bit far-fetched. great story, remarkeble that someone allready was aware of the coming times of technologie, the machine seems really something , like a prehistoric computer , if it was build by the mayas or egyptians. ppl would have believe it easyer, he doesnt seem really to grazy , more way ahead of his time, some Nostradames kind of person, had all these ideas and must have been a great thinker, and again humans in our time will always place things out of context in there own time , which create big wars like afghan ones.